Regardless of color, Scratch-dini is a professional-strength paste that claims to remove your car’s surface scratches in just a matter of seconds. In fact, the company claims that a 4oz tube of Scratch-dini is enough to fix “hundreds of scratches,” not only on your car, but also on your motorcycles, RVs, boats, trailers, jet skis, snowmobiles, and more. When compared to using local body shops, the Scratch-dini formula is 100% guaranteed, and can be hundreds of dollars cheaper. This may be part of the reason why the company claims to have over 500,000 satisfied customers, though this number has not been independently confirmed. When using Scratch-dini, you’ll simply place a small portion onto a clean cloth, and buff away your vehicle’s scratch. In essence, you’re wiping it away. Scratch-dini claims that the primary ingredient, BFGoodrich Carbpol, uses “millions of micro particles that gently and effectively remove surface scratches,” while also protecting your paint job. 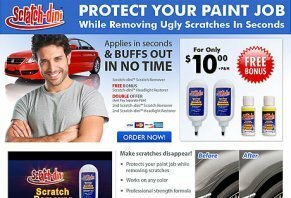 A single order of Scratch-dini includes one 4oz bottle, in addition to a headlight restorer/polisher, for $10 plus $7.95 shipping and handling. Like most “As Seen on TV” products, Scratch-dini will double your order—just pay an additional $7.95 shipping and handling. This means, for $26, you’ll receive two bottles Scratch-dini plus two headlight restorers, all of which comes with a 30-day money back guarantee minus all the processing and handling fees. If you’re not satisfied for any reason, simply call customer service at 866-684-5574 to initiate the refund process. It’s important to note that if you visit the Scratch-dini website and attempt to leave without making a purchase, you’ll receive a pop-up box asking you to stay. If you click on “Stay,” a new pop-up window will appear and provide you with a $5 per-order coupon. Should You Buy the Scratch-dini? If you’re considering buying Scratch-dini, there are a couple things to keep in mind. First, the Scratch-dini formula is intended to work only on surface scratches. In other words, if you have deep scratches on your vehicle, it will not work. In all fairness, the company’s website does mention the word “surface” in a couple instances, but most people without bodywork experience will miss this important detail. Second, Scratch-dini is an “As Seen on TV” product, which means that there are numerous online complaints stating that it does not work as advertised. Also, products such as these earn the bulk of their profits though inflated “shipping and handling” fees. This means that, even though Scratch-dini does come with a 30-day money back guarantee, these fees are not included as part of your refund—and you’ll be responsible for shipping it back to the company. Take the following as an example: If you ordered Scratch-dini today, you’d pay a total of around $26. If you didn’t like the way it worked and decided to return it, you would only receive $10 back, which doesn’t account for your shipping charges. When you also include this, it’s likely you’ll end up somewhere near $0. In reality, you’re likely better off trying to find a more reputable product at a local, physical store. While it may cost you slightly more, you’ll at least be able to return it for a full refund if it doesn’t work out. I used the headlight restorer kit lens polish on my 2011 GMC Acadia. I followed the directions to the letter and worked on only one headlight for no less than 20 minutes. Results...ZERO! This stuff didn't work at all. The lens didn't change a bit. Stay away from this stuff! It's a scam designed to take your money. I'm mad 'cause I had to give it one star...it deserves ZERO. I tried this according to direction on a small scratch on my 2016 Infiniti. Absolutely no results. Nada, nothing! What a scam this is. It says "with Carbopol EZ3," well my friends, Carbopol is made by Lubrizol and is used in most of your favorite hair gels like Dipidy Do. There are no ingredients listed on the package, so technically this is illegal and does not comply with California regulatory laws. Bottom line, I applied, waited, rubbed, did a voodoo dance, said a few prayers to the car paint gods, and voila...NADA (Spanish for nothing). So, "As seen on TV" is a con. I paid $10 for nothing. I highly recommend that you avoid any purchases from Tri-Sales Marketing in Somers, New York, as they probably have other useless products to try to con you into that don't work. I will report this accordingly. I welcome your comments! We tested it out on a very minor abrasion that was almost invisible to the naked eye. We followed the instructions, and it made it worse. It is absolutely a fake product. Never buy this! I bought this at Dollar General. You can buy it almost anywhere for $9.99 for a four ounce bottle except at Walmart. The one at Walmart is $31.60. Great stuff. I purchased this product today. I have tried numerous other products like it and nothing worked, so I thought I might as well give it a try. Well, it was absolutely no better than any other that I tried. I have a Z3 and tried it on several different areas and it is worthless – another one of those AS SEEN ON TV bombs. The company should be ashamed for advertising such a product. I will recant my remarks if the company can show me on my vehicle that it works. If I had read the reviews before purchasing this product, I never would have bought it. However, not knowing this I followed the instructions after scraping my car on the garage frame pulling out. It worked like magic. I'm so happy. Don't know what the other people did wrong, but you do need persistence and elbow grease. Tried it on various shallow scratches with no noticeable effect, except one where it just made it worse and I had to spend extra time polishing with alternatives to get it back to look less bad. Throw your money out the window. This stuff is crap. Taking back to the store. Go buy some Turtle Wax Polishing Compound. If Scratch-Dini is used for the right job it works, it does not fix dents or scratches, but for those minor marks such as shopping cart marks, and other minor abrasions, you have to be persistent and use a little elbow grease. I touched it after with a bit of Carnauba wax and it was like new again. I too ordered this product from them online. Unfortunately you are ordering live when you do it online and have no way to verify the cost or quantity until you place the order. The order is placed live, so good luck if there are any errors. My order was to be the 10.00 special with the free two bottles, would have to pay S&H for these. Order ended up being $73.00, I contacted them immediately, and just like everyone else. Order takes 2-3 hours for customer service to see. So I called back in 2 and of course for hour 3 they were closed. I called next day in AM and was told it was already shipped. I am contacting my CC company to dispute the charge. I wish I would have read some of these reviews before I bought this product. It did NOT work at all to even minimize my superficial scratching! Write a Review for Scratch-dini!